Wednesday, had my good friends from Madison, MS the Stribling boys(John, Alex and Charlie). This was the last and only day I could get the family on the water. Left early in calm conditions on a near shore trip. Had a NW wind so we ran to the bridges first. 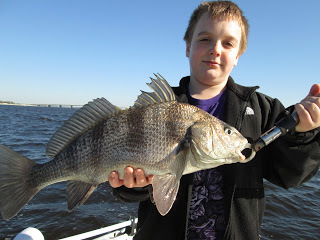 Hooked up on the first few casts with sheepshead and drum. 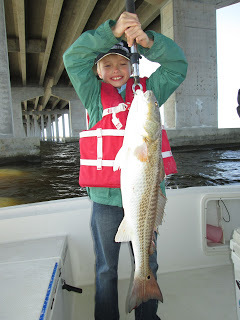 Young Charlie even hooked into a sea monster that drug him all over the boat and broke him off in the piling's. Shortly there after, the wind let loose and we had to move to stay comfortable. Tucked in behind the barges building the marina in Bay St Louis and yanked a few more drum and sheepshead in the calmer water. Captains Kyle and Kenny were down on the reefs catching a few, scouting spots for later trips. We were able to ease and peck our way home to Bayou Caddy with a following sea. Just a good easy day with a great family. Used dead shrimp on the bottom rigs all day. Did pull up several more pieces of limestone off of the reefs and bridges. If the pictures are not here, they are not here, they are on our website. 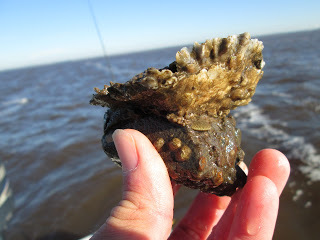 The last pictures I posted of them were muscles growing, this time it is big healthy live oysters. 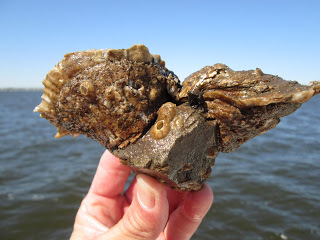 MORE REEFS=MORE SHELLS=MORE FISH!!! Thursday we had 4 boats out, and we all left late from the World Famous Bay Marina. Smart move, the wind dropped out and it was a nice calm afternoon. We all had near shore trips to the reefs and bridges. Can't believe we were able to push everyone to later in the week and get them out in such pretty weather. Capt Matt had the two person Jones crew, they made a good showing. 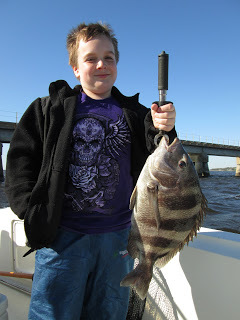 Like the rest of us, he was grabbing sheepshead at most every stop. Did hear over the radio that they did boat a big red next to Capt Brett. 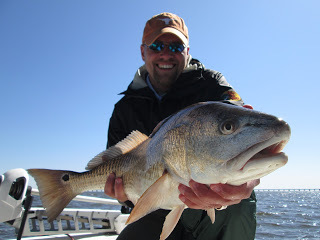 Hired Gun, Capt Brett helped us out with a very last minute booking with the 4 person Team Collin crew. Sounded like they started slow but finished strong when Brett got them into a rhythm. The older spring breakers did load up several cases of adult beverages. Guess like most of us, they are better dancers after you get a few drinks in em? I had the father and son team of Pastor John and his son Tyler(9) from TX. We did well on the best near shore action my boat has had this year. Almost every other cast for 4 hours was a bite and or a fish. Young Tyler did most of the damage and his dad was happy to take pics and video to send to his wife and kids at the beach. 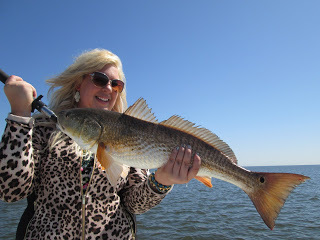 Was able to find a few reds with the shrimp, both were over 27 inches. 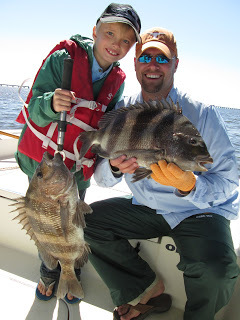 We stopped keeping sheepshead after number 12 and released many more. Speaking of released fish. Capt Kenny was out with Mr and Mrs Heatherly from AL. These seasoned Spring Breakers did the best out of all 4 boats. Their fish box was full not long into the trip. They spent the rest of the afternoon releasing everything. Kenny said they released way more than they kept. Friday we had 3 boats out, and it was gorgeous weather in the morning. 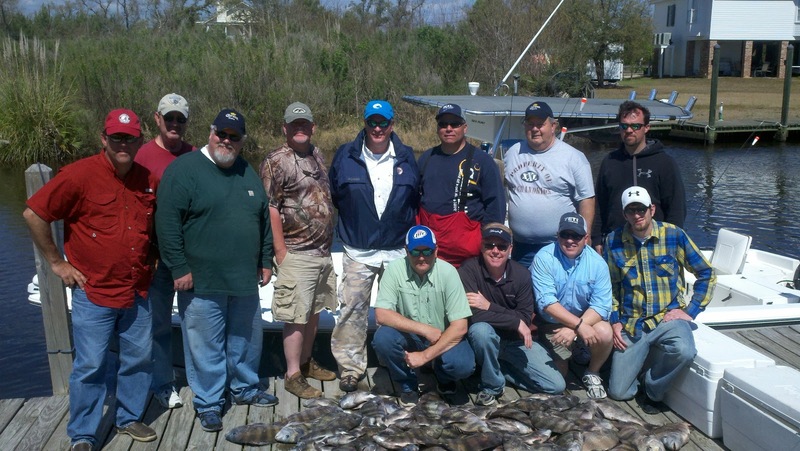 Captain Kenny and Captain Jimmy Ray were booked for the shorter near shore trips. I had Lynsey Miller and her pal Jessica from TX for trip to the LA Marsh. This trip was purchased by the CASA group that helps young children with foster care(a year ago). Been trying to get them on water for months, but weather always forced us to reschedule. Finally got it right and the girls were ready to roll. Went on the east side of the marsh, water was half way clean but saw little to no bait. Set the girls up on some carolina rigs and what do you know, more sheepshead. Was good practice for things to come so we kept 10 big ones and went looking for reds. Jessica was first to lock into one and few casts later Lynsey got hers. 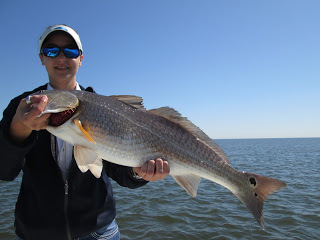 Did not have a problem finding red fish, had a problem finding slot red fish. Even while we were sight fishing, all the fish were 27 inches or better. Gotta Lynsey credit, she got pretty good a picking those suckers off, even when the wind picked up. Took a following sea home and sent the girls off to Bourbon Street with a cooler full of fillets. Was able to chat with Capt Kenny on the VHF. He was long done and at Sid Leblancs Boat House. I asked if the bite was still good in close, with the nice weather. Did not get a count, but when Kenny fired off his patented "OHHHH YEEEAAAH", I am sure they did more than fine. Saturday was more of a day for the corporate trips and bachelor parties. Captain Matt had team Ryan out for a near shore bachelor party. His crew boxed a few sheepshead and asked Matt to take them for lunch. Taking advantage of the nice weather, Capt Matt took the crew to Shaggys Bar and Grill in the Pass Christian Harbor by boat. I also ran a bachelor party, but my crew wanted to go the marsh. The Ulchey boys(Watts sr, Watts jr, Mike and Andrew) got a flat calm ride to the 9 mile area. We covered a lot water looking or trout and reds. 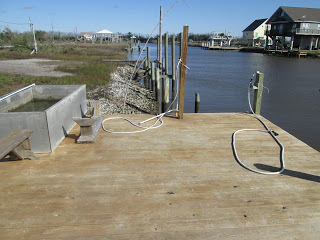 Water was dirty to the west and there was no bait in any of the bays we fished. Gave up on that quest, broke out the dead shrimp and went bottom fishing later in the day. Went to work on the sheepshead and ground mullet, bachelor to be Andrew even got the biggest fish. Water temp never got 60 degrees where we were fishing. Slow day in the marsh, but it won't be long things bust wide open out there. Just glad I threw a couple of pounds of dead shrimp in the boat that morning. Captains Kyle, Kenny and Jimmy Ray had the beer distributors for the 3 boat corporate trip, from Coors Light. Their trip last year was in less than perfect weather conditions. 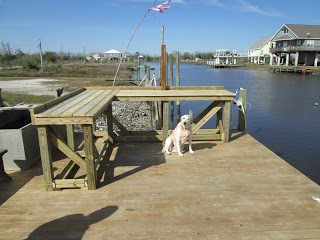 This year the boys got flat calm seas, and sunny skies all morning. I did run into the boys back at the BOATHOUSE that afternoon, and got the whole story. All the boats stayed in close for a 4 hour near shore trip, they were in fish from start to finish. 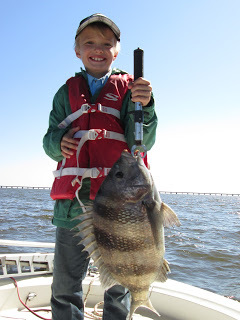 In just 4 hours the three boats caught a whopping 76 sheepshead(picture is at bottom of report)! Shore Thing has jumped on board with local tackle dealer Matrix. Ran into the owner/friend Capt Chas Champagne at the Biloxi Boatshow last week. We have known Chas for years and he is one of the hardest working guys in the business. 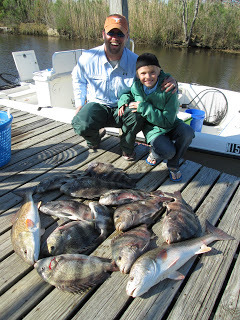 Since he is based out of Slidell, it is just easier to get the baits we like and need in bulk. We used the shrimp creole in the marsh on the spinner baits, worked like a charm and help up good. That extended paddle tail on the baits just seem have more "wiggle in the worm".